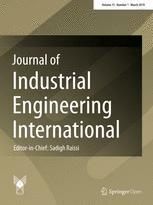 Journal of Industrial Engineering International is a peer-reviewed open access journal published under the brand SpringerOpen, covering all aspects of industrial engineering. It is fully supported by the Islamic Azad University, who provide funds to cover all costs of publication, including the Article Processing Charges (APC’s) for all authors. Therefore the journal is both free to read and free to publish in. The goal of this journal is to provide a platform for engineers and academicians all over the world to promote, share, and discuss various new issues and developments in different areas of industrial engineering. All manuscripts must be prepared in English and are subject to a rigorous and fair peer-review process. Accepted articles will immediately appear online.